Three days ago our bedroom still had carpet. Then four guys walked in. Oh and Liberache called. I almost can't decide if we should first talk about the four guys in my bedroom or the phone call from Liberache. Decisions, decisions. Here goes. 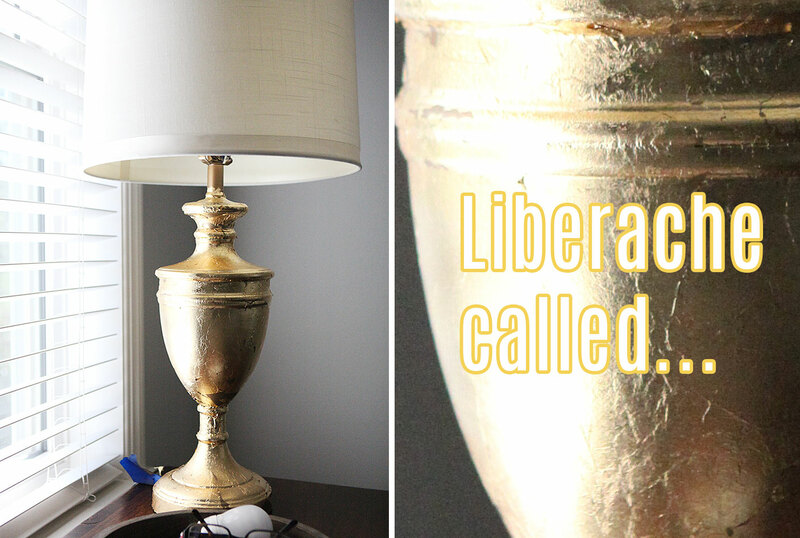 I had this idea to gold leaf our bedside lamps. Turns out it was not the best idea I have ever had. In fact it turned into a hot mess. Liberache even called and said he wanted his lamp back. We discussed the finer points of gold leafing and its proper use in design today. He had some great tips. Or just tips, actually. It started out well enough with me spray painting the lamps gold. Then I began adding leaf to the first lamp. After a while, before it was even done, I thought... hmm. Then I brought it up to the bedroom to see it in the space. Oy, it was not pretty. Even Liberache said: yeah .... no! So I removed all the gold again using mineral spirit and Goof off. Goof off actually worked the best. Probably because it has some solvent in it of some kind. It sounds easy in just a sentence, but let me tell you, if you want to gold leaf something, be very sure you want to do that because scrubbing and buffing to get it off is quite a chore. I used a scrubbing pad to scrape off the gilding and then continued with a tooth brush dipped into the solvent. I am still working on getting the rest of it off, but it's coming along. My new plan is to spray paint the lamps a solid color instead. Then I will add some gold in another way. Let's talk more about that in a little bit. On to some brighter news. The bedroom floor - this is so exciting - we had a crew come in and install new floors in the master, the closet and the hallway on Tuesday and Wednesday. Something we have been dreaming about for 5 years ever since moving in. Here you see some of the last carpet leaving our house. Woot! On Tuesday, four guys walked into our bedroom and a lot of awesomeness ensued quite quickly. Our sub floors were pretty uneven and that along with time and not having much of it were the two major deciding factors in hiring this job out. We have laid floors before and it's so much fun. No it's not. We had a crew come in and do major prep such as sanding down high spots, hammering in all the nails and adding screws to the sub floor and even using leveling compound where needed. 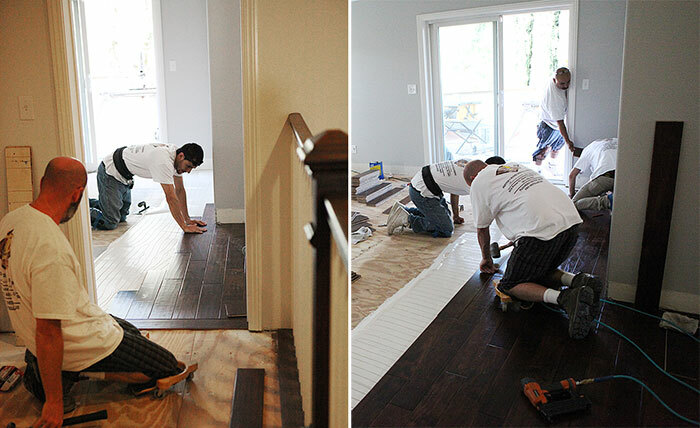 The floor was laid in the walk-in closet while this prep work was going on in the master. This took all of the first day. Our master suite is an addition from the previous homeowners and let's just say not all workmanship was done with the utmost care for details. The biggest problem was with the addition and where it is tied to the rest of the house through that doorway where you see the railing to the staircase (above). There was quite a high point there. This was solved both by evening out the floors as much as possible, and we employed a little trick to camouflage it as well. See below. While the flooring was being installed, I sanded, primed and painted all the baseboards. I used Zinnser alkyd primer and a white semi gloss alkyd paint. I am mentioning this so you don't think I was just twiddling my thumbs while work was happening upstairs. Also, it kept me from hovering too much, which I tend to do because I get so excited! Here you can get a sense of the sight line from the hallway looking into the master. I suggested that we flip a board by the threshold to camouflage the last bit of high point. When the light hits the sheen of the wood, you would probably have been able to see the peak a little bit, but with this board turned, it breaks off the pattern making it is practically unnoticeable. When the flooring was almost done in the master and only the hallway was left, Nick who was in charge of the job, leisurely mentioned that he thought we were short on wood - by 2-3 boxes. What? All the blood fell from my face and went straight to my feet when he said that. Had I measured and calculated wrong? Me? What? Frantic phone calls were made to the warehouse where we bought the wood: "Oh Acacia cocoa brown, yes, that is on back order until, oh, we don't know when, in all of California"! At this point I started hovering. I was WILLING that last flooring to be enough to cover all of the hallway. Internet searches for more flooring. Nothing. More phone calls. Nothing. That floor will be back in January. Maybe. Well that won't work. This is October. More pieces went down in the hallway. Four rows left, three rows left, two rows left. ohhh. Then Nick goes: I think we do have enough! The last boards were put in. We had 7 BOARDS TO SPARE and some scraps. So basically, I don't even know what the problem was. Then the freshly painted baseboards were quickly installed and everything was cleaned and wiped down before they left. I think our house was cleaner when they left than when they came. It turned out so, so beautifully. We hired through Angie's list and so far I am very impressed. In other bedroom news, I decided to scrap the chair for now. I am not excited about it enough to where I want to spend any time re-upholstering it. Instead, I have thrown that freed up time towards two new projects. One is refinishing my Grandfather's dresser. It will be getting fresh coat of paint and new hardware. The other project is this little adorable side table that I found on my morning walk at at garage sale a couple of weeks ago for $4! Four bucks! I will talk more about these two projects in a later update. Oh and then yesterday evening we went out to dinner to celebrate that I do know math after all, but mostly that there was enough flooring. We stopped by Anthropologie and picked up these three things for the bedroom makeover. Let's take another look at the floor. Here is the before. And this is what it looks like now! It's safe to say that we have fallen in love with this floor. The floor is Acacia Cocoa Brown and we got it for $3.99 per square foot. We had just under 470 square feet installed and installation and floor prep cost 2395 dollars. This included removing the carpet and disposing of it, more than usual floor prep including screwing down the sub floor, installing the floor, acoustic glue, and installing baseboards and caulking and filling nail holes in the base boards. I am only showing the master bedroom here, but also included was the hallway and the walk-in closet. 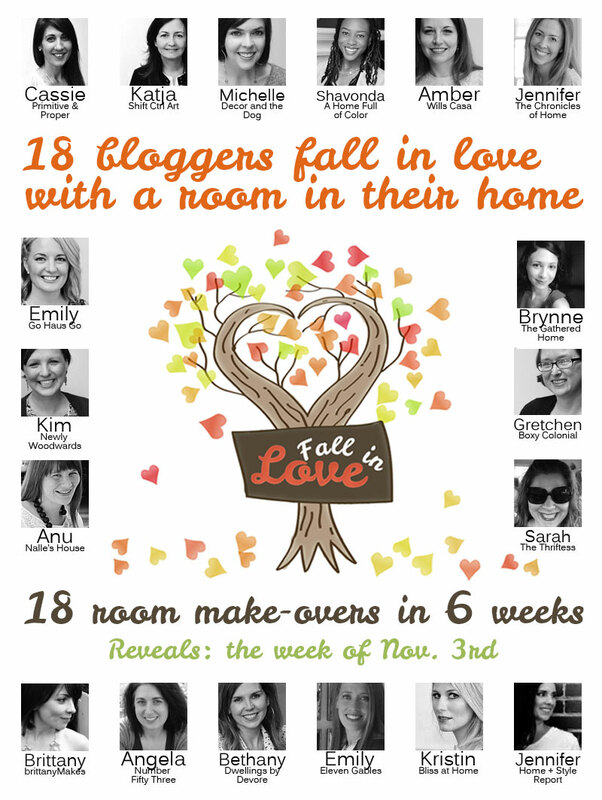 I am doing this room makeover as a part of a series with all these fantastic bloggers. You can catch up on what we have done previously here: Announcement and the planning post. This article: Fall in love: new hardwood floors and Liberache called first appeared on http://ahomefordesign.com.